The ANDYs has altered its approach this year by paring back the categories to just five; do you think the breadth of categories in many awards shows has got out of hand? In most cases, yes. Before we revamped the show, we put together a Creative Council of Chief Creative Officers from around the world to weigh in. And, in speaking with them, we asked - if we were to create a show today what would it look like? We found that the biggest complaint they had about advertising award shows was the number of categories. To them, it seems like a money-making scheme. Our new model allows for an even playing field. The lens is squarely focused on the idea itself, and what makes the idea so compelling. Spotlighting great work and great talent is what we want to stand for. "We want to create a seat at the table for everyone – students, awards managers, creatives at every level, and marketers." How did you decide on the now five categories you have? The ANDYs have always focused on the strength of the idea. And so now we will recognise all the attributes that make the idea great, without having to enter them in a long list of categories. Other areas of distinction include: Excellence in Craft and the production quality; Social Good; and RESET which is game-changing innovation. Additionally, The BRAVERY Award recognises work that ultimately would not have happened without the marketer’s collaboration, trust and advocation. We’re seeing more and more work that is considered Brave. It’s an exciting time for our industry and we look forward to seeing what’s to come in that space. The ANDYs is one of the first big awards of the calendar year; do you think it’s a good indicator of what work might triumph across the rest of the year? We think so! Historically, we’ve been recognised as a predictor of work that will do well in award season, many entrants use the ANDYs as a test because the jury is so senior. We took things a step further last year by actually publishing our predictions - identifying 10 pieces of work that would go on to sweep the other shows. For the record, we were 10 for 10. Above: Pete Favat in his ANDYs call for entries video, posted on social media. You have one, integrated jury rather than a selection of different ones; is that also a new element and why do you think that approach works best? When other shows were spinning off and creating multiple juries for this new media called digital – we stayed the course because we believed when ideas started to cross platforms and digital initiatives became a standard part of every campaign it was the new norm. And we were right. "We work hard to ensure our jury represents a complexion of the global advertising community with an emphasis on diversity." How do you decide who should be on the jury each year? We start with the selection of a jury chair in collaboration with the previous year’s chair. The chair holds the seat for two years for continuity. Then we work closely with him or her to ensure we’re inviting the industry’s brightest and most award-wining creative directors from around the world. And of course, we work hard to ensure our jury represents a complexion of the global advertising community with an emphasis on diversity. You’re also streaming the judging process live on Facebook; what do you think that will bring to the judging process? More than anything, we believe this kind of transparency will open up the conversation on creativity and serve as an educational tool. We want to create a seat at the table for everyone – students, awards managers, creatives at every level, and marketers. The Facebook LIVE partnership gives us a world class platform to open up the judging room without compromising the peer-to-peer experience our jury has come to enjoy. 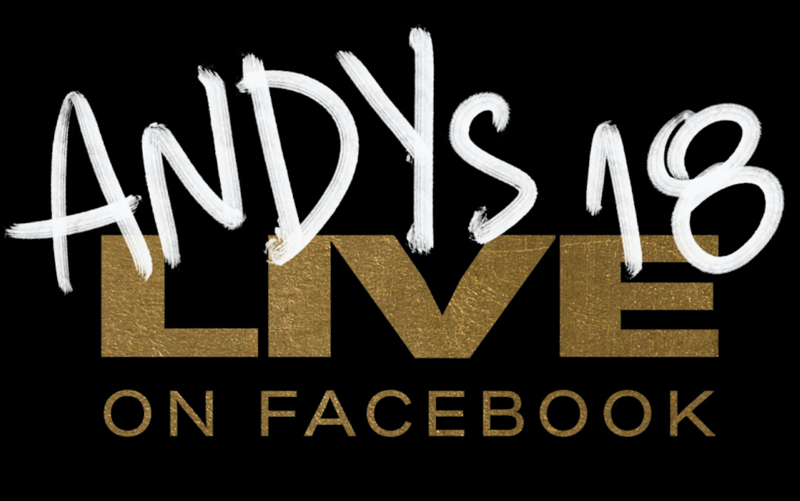 We are excited to share what sets the ANDYs apart from the entire industry. Above: Colleen DeCourcy in one of the social media campaign videos for this year's ANDY Awards. To find out more about the ANDY Awards , its jury, the entry process and previous winners, please click here.